This is “fall back” weekend, and I feel that I have used the extra hour granted to me by our DST Overlords in a productive and meaningful way. I can’t say that all the productivity and meaning happened within one specific hour – it was parceled out among the measly 48 hours of the weekend. Make that 49 hours. This spring-forward, fall-back action creates some tension for me. I never want to spring forward, but I do enjoy the falling back. So what did I do with my hour that was so meaningful and productive? Went for a walk in the neighborhood with the Resident Expert. 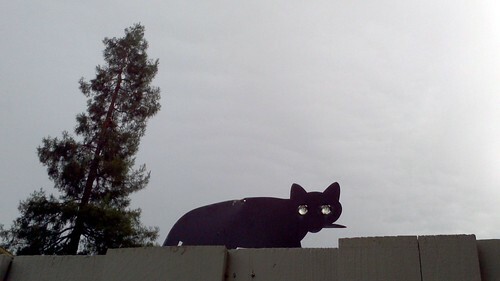 One of the neighbors has this metal cat with shiny glass eyes on their fence. Never noticed it before.